The event provides access to CPD accredited seminars from industry leaders, showcases from exclusively selected exhibitors and free training from experts, so care providers can keep up-to-date with the latest products, technology and trends that are reinventing the care sector. Speakers at this year’s event include National Care Forum Executive Director Vic Rayner, Sunrise Senior Living Director of Memory Care Jackie Pool, National Care Association chair Nadra Ahmed, RemindMeCare co-founder Simon Hooper, CCTV campaigner Jayne Connery, CQC Head of Inspection in London Alison Murray, Lee Mummery of Skills for Care, and Stephen Dorrell and Henry Elphick from LaingBuisson. Masterclasses on accessible information standards when supporting people with dementia, accessing funded training and leading change in social care will be hosted by QCS, Learning Curve Group and everyLIFE Technologies, respectively. Attendees will also be able to access Training 2 Care’s Virtual Dementia Tour. Care Home Professional will be among the exhibitors. Come and see us at Stand D40. 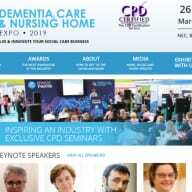 The post Dementia, Care & Nursing Home Expo 2019 gets underway appeared first on Care Home Professional.